The Canon EF 70-200mm f/4L USM Lens is arguably Canon's best value "L" Lens, combining professional grade build and optical qualities. Though solidly built, the 70-200 f/4L is relatively light (25 oz / 705g). Actually it is very light and small compared to the much more substantial Canon EF 70-200 f/2.8L Lens or the Canon EF 70-200mm f/2.8L IS II USM Lens. This lens is not a burden to carry for long periods of time but has a high quality, solid feel. 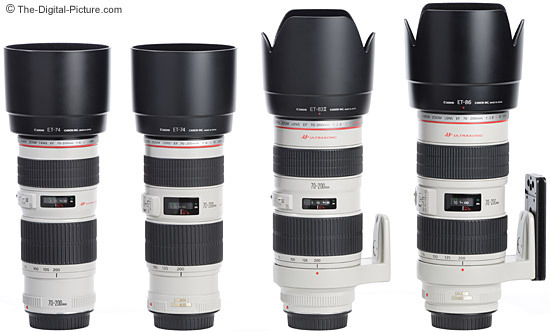 At 3" (76mm) in diameter, the 70-200 f/4 is relatively narrow for its 6.8" (172mm) length. I more frequently use larger diameter lenses, so this is one of the 70-200 f/4's instantly recognized features for me personally. It is not a bad thing - just different. I'm sure those with small hands appreciate this feature. 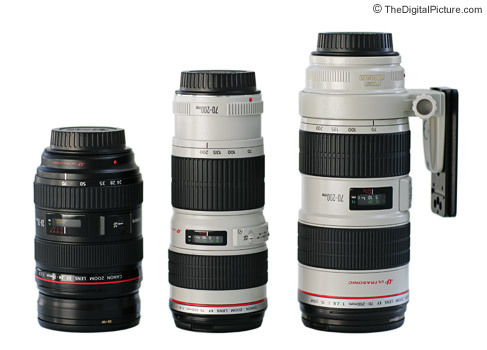 Pictured above from left to right are the Canon 24-70mm f/2.8L USM Lens, the Canon 70-200mm f/4L USM Lens and the Canon EF 70-200mm f/2.8L IS USM Lens. Results from the Canon EF 70-200mm f/4L USM Lens will make you smile when reviewing at 100% on a monitor. This lens is very sharp wide open and improves only slightly when stopped down - and primarily in the corners at the wide end of the focal length range. Very slight barrel distortion is noticeable at 70mm on a Full Frame body. Distortion disappears by around 100mm and is insignificant on a 1.3x or 1.6x FOVCF body. Vignetting is very well controlled - full frame users might notice slight vignetting in the corners at f/4. CA is very well controlled. Images from the 70-200 f/4L have great color and bokeh (foreground/background blur quality). The 8-blade aperture opens to a constant f/4 at all focal length ranges. This is a very nice feature as exposure settings do not require a change as the lens is zoomed through the focal lengths. F/4 is not fast and is not slow. F/4 is narrow enough to allow the smaller lens size and weight. F/4 is wide enough to create some background diffusion in this focal length range. F/4 is wide enough to not require bright light for handholding. However, I do not consider this a low light lens. You will likely need a flash when shooting indoors after the sun sets. The Canon EF 70-200mm f/4L USM Lens focuses very fast, very quietly and very accurately thanks to Canon's excellent Ring USM (Ultrasonic Motor). FTM (Full Time Manual) focusing is enabled. The focus and zoom rings are very nicely sized and turn very smoothly. The 70-200 f/4 does not extend with zooming or focusing - and the front element does not rotate. With a minimum focus distance of 3.9' (1.2 m), the 70-200 f/4 yields a maximum magnification of .21x. This value is reasonable for flower pictures and close portraits. Adding a 12mm Extension Tube will take this figure to .28x at 200mm, but better results come from the addition of a 25mm Extension Tube - yielding a .42x magnification at 70mm. As the 70-200 f/4L is compatible with the Canon Extender EF 1.4x II and the Canon Extender EF 2x II, these are popular accessories for this lens. With the 1.4x, the 70-200 f/4 becomes a 98-280mm f/5.6 lens that retains excellent image quality (adding more barrel distortion and some additional CA). But, image quality starts declining more noticeably with the 2x and the resulting 140-400mm f/8 lens only autofocuses on Canon's 1-Series bodies. This combination also results in a very dark viewfinder. The extenders increase the maximum magnification to .31x and .45x. Above from left to right are the Canon EF 70-200mm f/4L USM Lens, Canon EF 70-200mm f/4L IS USM Lens, Canon EF 70-200mm f/2.8L USM Lens and Canon EF 70-200mm f/2.8L IS USM Lens. The two f/2.8 lenses are shown with their included tripod rings. The f/2.8 IS lens is shown with an optional Wimberley P20 Lens Plate attached to the tripod ring. The same lenses are shown below with their included lens hoods attached. Filters are always popular lens accessories ... The 70-200 f/4 has a 67mm filter thread size - the relatively small-sized filters do not cost a fortune. The Canon ET-74 Lens Hood and an inexpensive lens pouch are included in the box when the 70-200 f/4L is purchased from a reputable retailer. The Canon Tripod Mount Ring A II (W) (or the prior non-II A version), although relatively expensive, can be purchased as an accessory. The tripod collar is nice to have, but with a solid tripod/head combination it is not required. There are MANY uses for the Canon EF 70-200mm f/4L USM Lens, but portrait photography is one of the best. Classic portrait focal lengths range from 85mm to 135mm effective focal lengths (field of view crop factor included). The 70-200 f/4.0L lens comes with most (or all for full frame and 1.3x body users) of those mms included. I often use even higher focal lengths for tight portraits - 200mm and/or a 1.6x FOVCF body allows for these tightly-framed shots. Outdoor sports photography is another popular use for the Canon EF 70-200mm f/4L USM Lens. It is an ideal lens for young children's soccer matches when mounted on a 1.6x FOVCF body. You might want to add a Canon Extender EF 1.4x depending on the size of the subjects and their playing field. The Canon 70-200 f4 lens is generally too slow for indoor action photography unless you can utilize an accessory flash such as the Canon 580EX Flash. Early or late outdoor action sports photography is better handled with the Canon EF 70-200 f/2.8L Lens or the Canon EF 70-200mm f/2.8L IS II USM Lens. Heavily overcast days are also a challenge for action sports photography with the 70-200 f/4L. Need a walk-in-the-park or a beach lens? The 70-200 f/4L is ideal for my uses. Combining excellent image quality with relatively light weight and small size, the Canon EF 70-200mm f/4L USM Lens has a good focal length range for grabbing candids of the kids and family at play. General wildlife and nature photography is area where the 70-200 f/4L may not be ideal, but often finds use in. Depending on their size and distance, wild subjects may not frame tightly enough with the bare 70-200 focal length. But, this lens starts having some nice reach while retaining very good image quality when paired with the Canon Extender EF 1.4x II on a 1.6x body. Wary small birds and animals will likely require a longer lens altogether. When thinking about a landscape lens, many photographers immediately think wide angle lenses. Wide angle lenses can take in vast scenes, but the 70-200mm focal length range is a favorite of professional landscape photographers as it yields beautiful compressed landscape images. When photographing landscapes, wide apertures are generally not needed as narrower apertures are generally used for greater depth of field. When photographing landscapes, packing light makes the long hikes often required to get to the beauty easier. As some of the beauty of landscape photography is in the form of flowers and other smaller objects, the magnification ability of the 70-200 f/4 is useful for this purpose. Thus, the Canon EF 70-200mm f/4L USM Lens is ideally suited for landscape photography use. 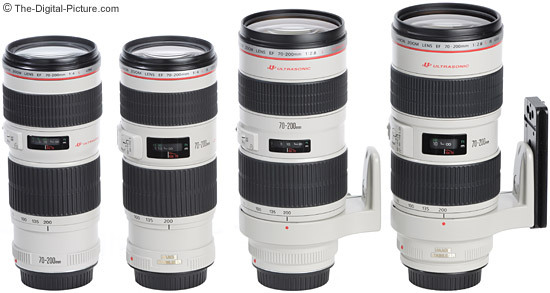 Those contemplating a 70-200 f/4L purchase are typically considering the Canon EF 70-300mm f/4-5.6 IS USM Lens as well. Priced similarly with an extended focal length range and an excellent implementation of IS, this lens fills many of the same requirements as the 70-200 f/4. I usually recommend the 70-200 f/4 over the 70-300 IS because of its physical and optical advantages, but read the 70-300 review to find out which is better for your needs. The Canon EF 70-200mm f/2.8L IS II USM Lens is a GREAT upgrade from the 70-200 f/4 L, but only if you need f/2.8 (lets twice as much light in) and/or IS - or weather sealing (the 70-200 f/4 is not weather sealed). You will not find the IS version's image quality to be much better - Full frame corner sharpness is better on the IS lens until the end of the focal length range where they equal out. The f/4 version performs better than the IS lens with Canon Extenders when used at the 200mm setting until both are stopped down to f/8 or so. An f/2.8 aperture will create a more diffuse background blur. The IS version carries significantly more weight and costs much more than the smaller f/4 version. If you cannot afford a Canon EF 70-200mm f/4L IS USM Lens, Canon EF 70-200mm f/2.8L Lens or a Canon EF 70-200mm f/2.8L IS II USM Lens, the 70-200 f/4L is for you. If you do not need your 70-200mm lens to be faster than f/4 and don't need IS, the Canon EF 70-200mm f/4L USM Lens is your lens. The 70-200 f/4L is a great value and a highly recommended lens.